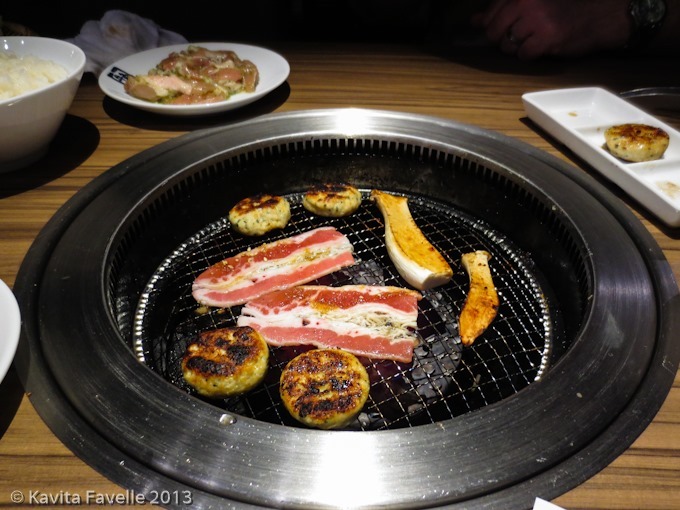 In China, Taiwan and North America, yakinuku (literally “grilled meat” *) is often referred to as Japanese barbeque but in Japan itself, it’s very much considered a Korean import. In the UK, it’s not well known at all. Yakiniku is DIY dining at its finest! Diners gather around a charcoal or wood burner, usually placed in the centre of the table, and cook their own meal, piece by piece and at their own pace. 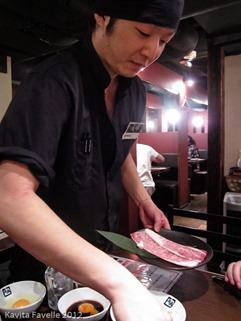 Many specialist restaurants have yakiniku grills built right into the tables, with extractor systems to whip away smoke and smells. Others bring portable grills to the table, quickly switching them with a hotter replacement should the coals die down during your meal. 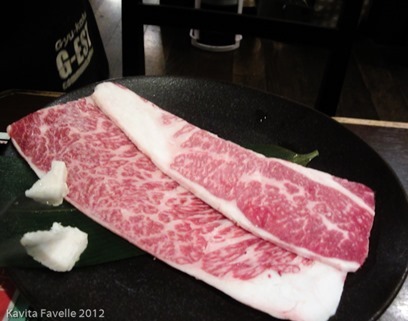 Most commonly, thin slivers of raw meat are ordered according to the cut. 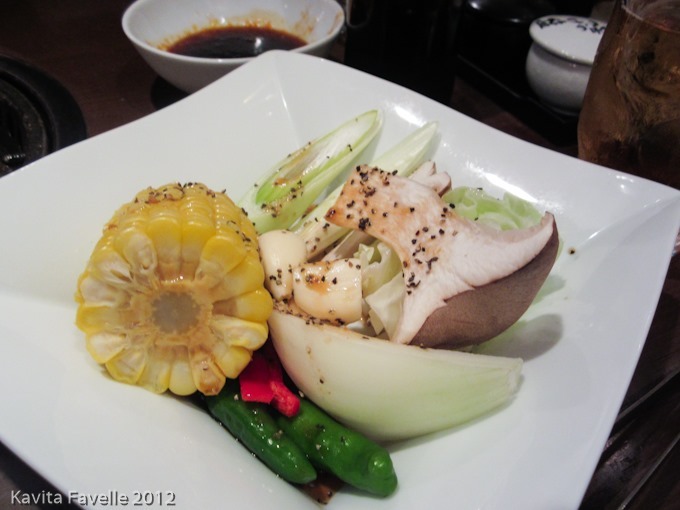 A variety of vegetable accompaniments is usually available, though the choice is sometimes limited, and the vegetables are clearly secondary to the meat! Most restaurants also offer a range of side dishes (such as rice, noodles and salads) which don’t need to be cooked on the grill. Again, these are simply a supporting act to the meat. Yakiniku is perfect for 2 to 4 diners (any more than that and you’ll need multiple grills so everyone can reach). Sit down, check the menu, order your favourites and cook them just as you like them. Some of the raw meat will come plain – thinly sliced and ready to grill; some will come marinated in a sticky tare (sauce); you may also be given raw egg or other sauces in which to dip pieces of meat once they have been cooked. 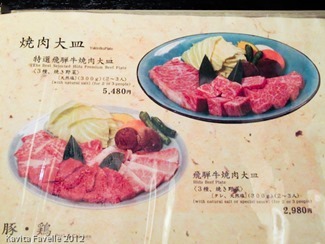 Beef and pork are the most common choices. Some yakiniku restaurants specialise in horuman (offal), their menus listing more different types of offal than I ever imagined existed! 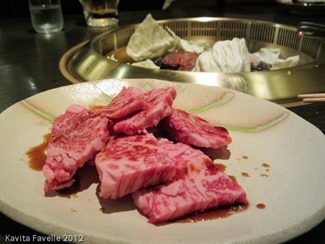 My first choice is the fattiest and most tender cuts of beef, which work well when flash grilled for mere moments until the fat starts to melt. 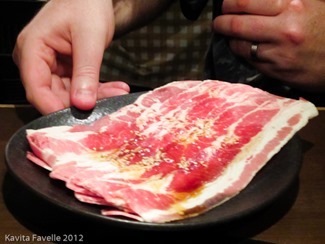 I’m also addicted to thin slices of fatty belly pork, cooked a little longer until the fat starts to bubble and brown. * Yaki most commonly refers to cooking on a grill, but can also mean frying or tempering. 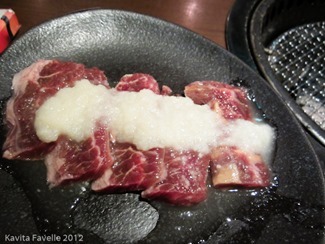 According to most web resources, including Wikipedia, yakiniku originated in Korea. 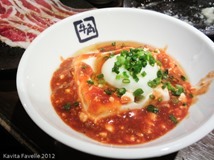 Korean food became popular in Japan during the 20th century, especially in the years following World War Two. Korean restaurants advertised themselves as offering chōsen cuisine; the term came from Joseon, the name of the old, individed Korea but when Korea split into two North and South nations following the Korean War, Joseon was appropriated by the North. 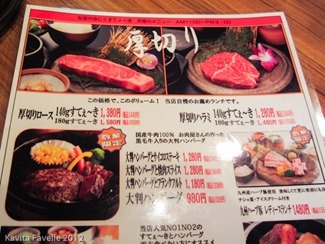 Businesses in Japan, more sympathetic to the South, removed all chōsen references and instead labelled their food as kankoku (South Korean). 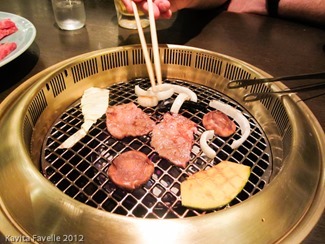 Restaurants serving bulgogi (grilled marinated beef) and galbi (grilled ribs) were known as horumonyaki (offal grills). 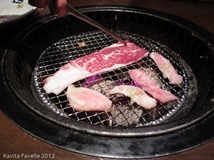 Although this is the history trotted out whenever the origins of yakiniku are discussed, isn’t it a little simplistic not to take into account the fact that grilling meat was already prevalent in Japan before the influx of Korean cooking, even though beef was not widely eaten until the late 19th Century? 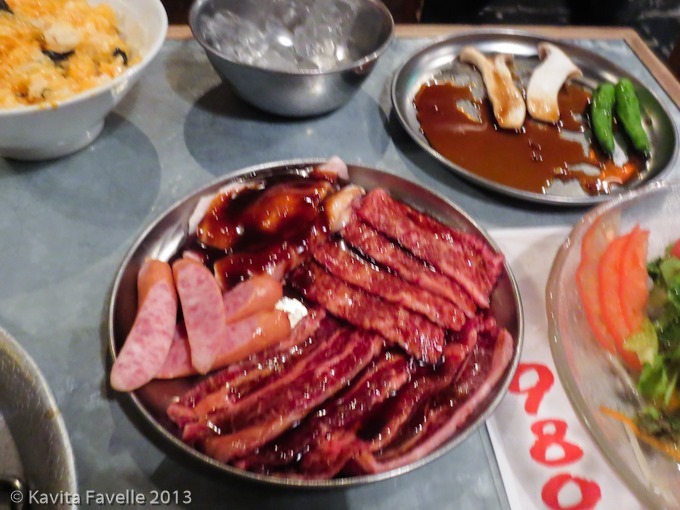 Perhaps it is the use of the wonderfully-flavoured marinades that mark yakiniku as a Korean-influenced cuisine? But yakiniku, as it is enjoyed in Japan today, is not wholly Korean either – the prevalence of offal and the use of dipping sauces (in which the meat is dipped after cooking, rather than before) are, apparently not common in Korea. 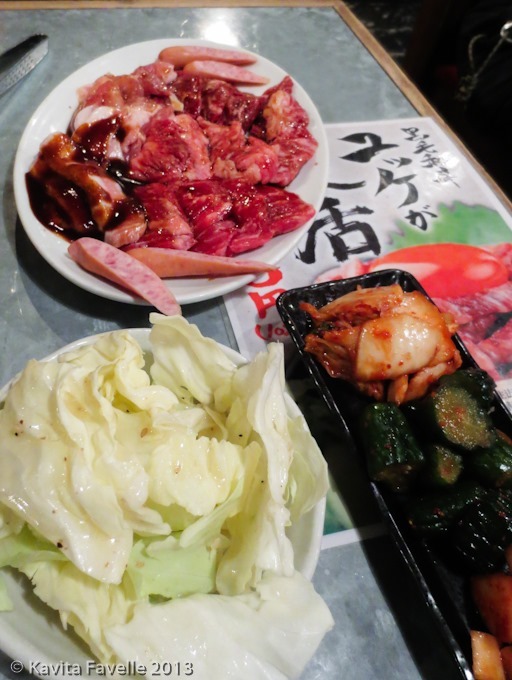 Regardless of the exact origins, the association between yakiniku and Korean food is a strong one and many yakiniku restaurants in Japan commonly offer a range of Korean dishes including kimchi and spicy tofu. I’m not sure when the general yakiniku (grilled meat) term came widely into use for this kind of cooking but the All Japan Yakiniku Association was established in 1992 and proclaimed August 29 as an annual Yakiniku Day in 1993. 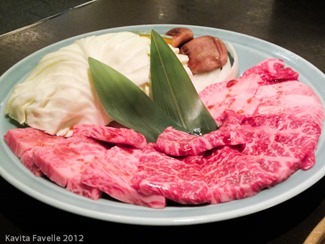 The date is described as goroawase (numerical wordplay) because the numbers 8, 2 and 9 can be read as ya-tsu-ni-ku, an approximation of yakiniku. Yakiniku has seen its fortunes rise and fall according to a variety of influences. 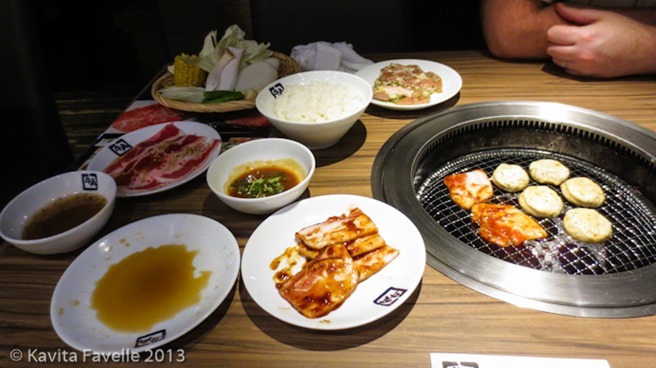 In the 1980s, the introduction of modern ventilated systems, which allowed restaurants to easily eliminate smoke and cooking smells, gave open grill restaurants a big boost. So too did the easing of beef import restrictions in 1991, which resulted in a drop in the price of beef. However, the 2001 occurrence of Mad Cow Disease (BSE) in Japan was a set back. 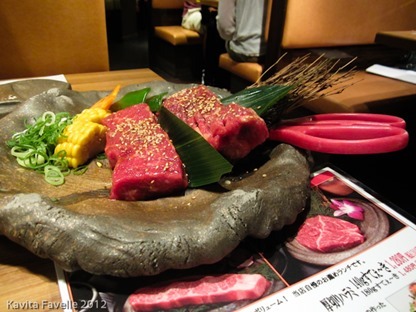 ~ This (PDF) article on The Meat Eating Culture of Japan gives a fascinating, detailed history of ancient meat-eating customs, the prohibition of meat and the lifting of restrictions. ^ Here’s an entertaining article from Japan Today with a theory on why and how diners may be forming an addition to meat! The best beef we had in Japan was also our first yakiniku experience, at Maruaki, a Hida Beef restaurant in Takayama in 2012. 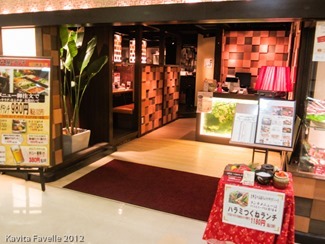 On that same trip, we came across this restaurant in department store restaurant floor. A sign outside invited overseas customers to tell the restaurant manager he was handsome in return for a free beer. We did, he giggled, we received our free beers! Gyu-Kaku is a large Korean yakiniku chain with several hundred branches across Japan (and quite a few internationally too). Many of the meats come marinated and there are various dipping sauces, including raw egg ones, to dip the cooked meat into before eating. We really liked the spicy tofu with mince meat side dish as well. Another visit to a different branch of Gyu-Kaku, on our second trip. 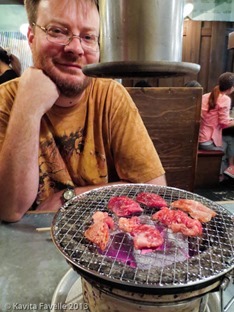 We chose Showa Taishu Horumon in Osaka’s Dotonbori district for a number of reasons – specialising in horuman (offal), but with regular cuts also on the menu, it gave me the opportunity to try cuts I’d never normally try; I found the retro ‘50s vibe to the decor rather appealing; I liked the bucket barbecue grills; everyone inside looked happy; staff were welcoming. By the way, Showa Taishu Horumon has a a few branches in the area, this one is located at Dotonbori 1-5-9 1F, on the area’s main street. 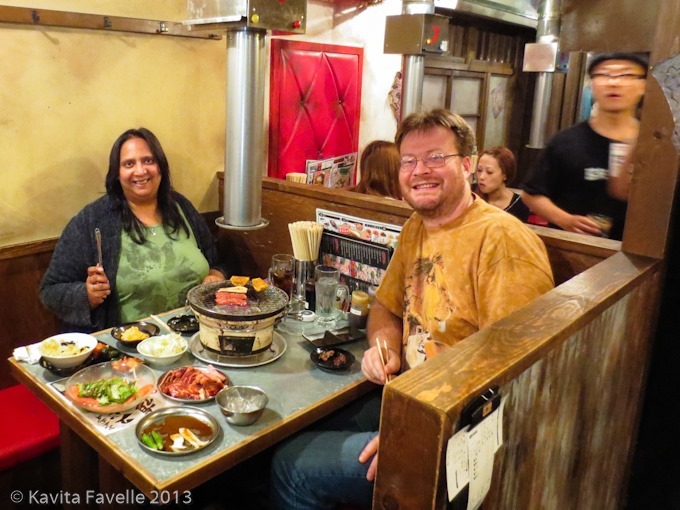 We had a great meal – I discovered that oesophagus is definitely not for me but confirmed I’m happy to eat cheek and tongue. I chose not to explore the extensive tripe menu! 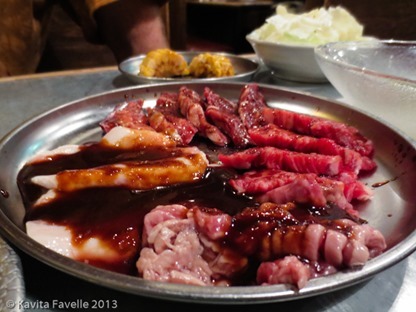 And the regular beef and pork cuts were delicious! 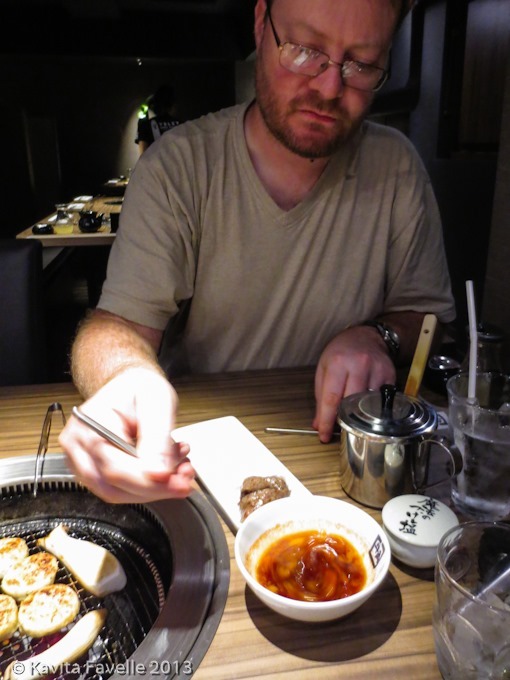 Next, Pete and I bring yakiniku into our kitchen for a home made Korean-Japanese BBQ. Coming soon! 5 Comments to "What is Yakiniku? | Enjoying Yakiniku in Japan"
I am reading these in totally the wrong order but I love reading about Japan and especially anything food related! Thanks for sharing! Thanks Heather, so pleased you are enjoying! I love the idea of this. 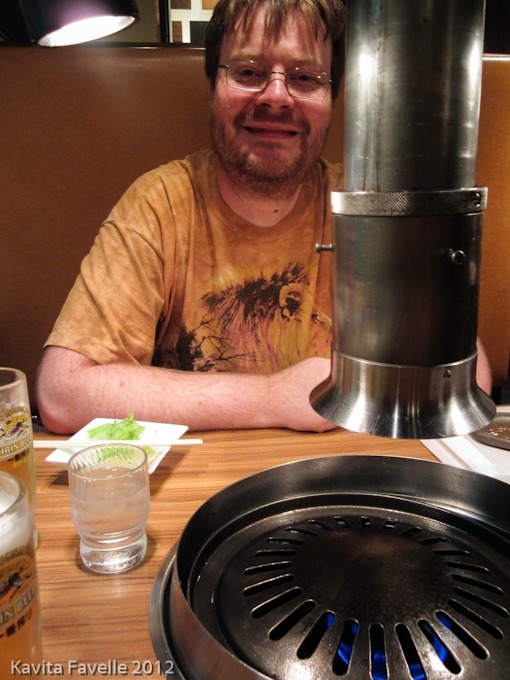 For a while there were a couple of restaurants near here where you could cook your meat on your own griddle (not Japanese). It’s such a fab idea. 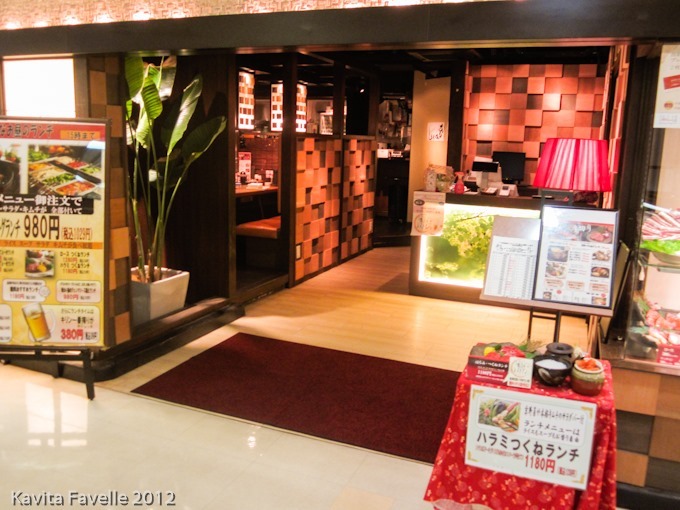 We aim to plan a trip to Japan at some point, and when we do your blogposts will be so useful. I’d love the fatty pork pieces too!